It may not be “THE” question, but deciding to invest in a Roth IRA or convert to a Roth IRA from a Traditional IRA can have a substantial long-term effect on your financial future. The use of compounding and tax deferral are potent strategies to build wealth, and adding tax-free treatment on eventual distributions seems to be like icing-on-the-cake. 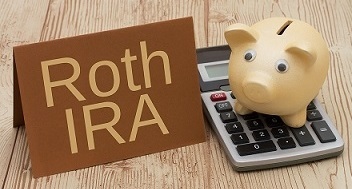 A Roth IRA has the same features of compounding and tax-deferral as a Traditional IRA, but it also has the feature of tax-free treatment of distributions - but there is a catch! Unlike a Traditional IRA or a 401(k) where contributions, in most cases, are tax deductible, a Roth IRA conversion from a Traditional IRA, or a contribution to a Roth is not tax deductible - you pay tax on the conversion or contribution amount. Whether to pay taxes up-front instead of in the future when distributions are made is the pivotal question - let's take a look. The tax is due upfront on the amount of conversion or contribution (by April 15 of the year following the conversion). There is no tax on the distributions of Roth IRA’s once you have met the 59 ½ age and five-year wait requirement. The common word in the two exceptions listed above is “TAX.” While there are other considerations to consider when deciding which is the best option for you, the analysis of the taxes you pay upfront weighed against the expected tax savings you will experience each year you take a distribution should get the most attention. Like most decisions requiring financial matters, a level of uncertainty exists. But since the unknown of investment performance is equal with both IRA's, we can isolate the uncertainty to future income and future tax rates. In addition, future income, in most cases, is not a large unknown. Whether income will be from retirement accounts, rentals, wages, social security, pensions, or investments, careful planning can help determine future income as accurately as possible. But future tax rates? Unknown. And in most cases, it is not next year's tax rates or the rates in a couple of years that need to be projected - It is the rates which generally will be years out to the future (Roth IRA requires a five-year waiting period to begin taking tax-free distributions of earnings). Let"s look at an example which illustrates the impact of changing tax rates - current and future. Jack, who is 55, is deciding whether to convert his $500,000 Traditional IRA (or Rollover IRA) to a Roth IRA. For illustrative purposes, the marginal tax rate for Jack if he converts in Year 1 would be 45% (Federal 35%, State 10%). Jack plans to begin taking distributions at age 65 (4% distribution rate per year). Let us assume the marginal tax rate in Year 10 for his $20,000 distribution is 30% (Fed 20%, State 10%). Let us also assume that for the 10-year period, there will be no growth in the Roth IRA (account balance remains at $500,000). In the above example, Jack avoided the $6,000 tax since Roth IRA distributions are non-taxable (provided age and time limit provisions are satisfied). However, $225,000 is the amount of taxes paid in Year 1 - at this pace (with no growth), it would take approximately thirty-eight years to make up the $225,000. Clearly, the marginal tax rate of 45% in Year 1 would be problematic unless Jack's future tax rates would be much greater (and therefore, the tax savings would be greater). Let's take a look at the situation when the current marginal rate is 30%, instead of 45%. Jack, who is 55, is deciding whether to convert his $500,000 Traditional IRA (or Rollover IRA) to a Roth IRA. For illustrative purposes, the marginal tax rate for Jack if he converts in Year 1 would be 30%(Federal 25%, State 5%). Jack plans to begin taking distributions at age 65 (4% distribution rate per year). Let us assume the marginal tax rate in Year 10 for his $20,000 distribution is 35% (Fed 25%, State 10%). Let us also assume that for the 10-year period, there will be no growth in the Roth IRA (account balance remains at $500,000). In the above example, Jack avoided the $7,000 tax since Roth IRA distributions are non-taxable (provided age and time limit provisions are satisfied). However, $150,000 is the amount of taxes paid in Year 1 - at this pace (with no growth), it would take approximately twenty-two years to make up the $150,000. If Jack's life expectancy, once he reaches sixty-five, is approximately twenty to twenty-two years, the impact of converting to a Roth would be minimal (assuming tax rates remained the same during distribution period). Now Let's take a look at the situation where there is investment growth for the 10-year period of 7% annualized return. Jack, who is 55, is deciding whether to convert his $500,000 Traditional IRA (or Rollover IRA) to a Roth IRA. For illustrative purposes, the marginal tax rate for Jack if he converts in Year 1 would be 30% (Federal 25%, State 5%). See above example where taxes due are $150,000 on conversion. In addition, the projected growth rate will be 7% annualized return for the ten year period. In the earlier examples, we assumed no investment growth, but for a Roth to make financial sense in most cases, you have to not only make up the amount paid upfront in taxes but also there is the potential investment growth of those taxes. So the growth rate of 7% used for the IRA original balance of $500,000 should also be applied to the 150,000 paid in taxes (2nd example). So while the projected tax savings of $14,000 appears to recover the upfront taxes of $150,000 much faster (approx. eleven years), the actual recovery period has to include the lost potential growth of the $150,000 - total of $300,000. Now the recovery period is the same as the earlier example - close to twenty-two years. It's not the growth (same for both IRA's), it's not the risk tolerance (same for both IRA's), and it's not the time horizon of the investment ( but the longer the life expectancy from the point of distributions, the greater the opportunity to "recover" the taxes initially paid). It's the future tax rates that should be the critical factor to assess if a Roth IRA is a good financial decision. Here at Carr Wealth Management, LLC, we offer the expertise to help you analyze the various factors that make the decision to make the potentially wealth-building Roth IRA a part of your investment portfolio.